and other environmentally friendly products we use in everyday life. We care about the environment and our products are designed to work with little or no effect to the world around us. If we don't believe in it, we don't sell it. BioBag Food Waste, BioBag Tall Kitchen, BioBag Dog Waste, BioBag Ecoproduce and more. MaxAir Kitchen Bin - Organics collection bin reduces odours, mold and fruit flies. Over 3 Million Sold! 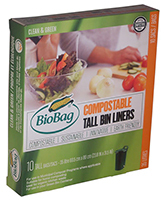 BioBag Ecoindustrial Bags and Bin Liners - Ecolife's BioBag Ecoindustrial line of tough & reliable compostable bin liners available in bulk quantities for schools, government, institutions, and the hospitality industry. 100% compostable. Certified. EcoProduce Bags - an eco-friendly alternative to polyethylene produce bags. EcoProduce bags are food grade approved and are fully compostable and biodegradable. An excellent choice for supermarkets, grocery stores and farmer markets. BioShop is Ecolife's highly successful line of compostable & biodegradable retail shopping bags. Three sizes to choose from. Green Bag - reusable bags that offer an enviromentally friendly alternative to traditional plastic shopping carrier bags. Strainee saves costly plumbing repairs and reduces maintenance by offering the first ever fully compostable and biodegradable corn starch strainer for sinks, bathtubs and showers. Ask for it by name Strainee! Earth friendly clog prevention for home, hospitality, and industrial applications. Shower Strainee, Bathtub Strainee & Shower Strainee great new products for a eco friendly home or business! EcoHumidifer automatically controls indoor humidity with no electricity or noise. Easy to use and highly effective. Ingeniously designed the award winning EcoHumidifier provides moisture to dry air 24 hrous a day, 7 days a week. New Green Product.